Forget the game; I’ll be neck-deep in the mini crockpot. Except true thing –> we actually don’t really watch the Superbowl. Not that we’re anti or anything, and we love to go to Superbowl parties (not saying, just saying), but we just don’t have a TV. Kinda need one of those for the Superbowl. One time we tried to stream a live football game from the interwebs and somehow we ended up with a very scrachy, blippy, fuzzy NFL game with the audio all in Spanish. But you know what happens in the Philippines? You get locked out. There is no online viewing for certain countries. Seriously. One time we thought we got it working so we made popcorn, got drinks, and cranked the AC up only to get about three seconds of precious viewing time before the scramble-freeze screen. It was 200x more dramatic than it should have been. If only this artichoke dip had been around then. But the Superbowl. I honestly didn’t even know when the Superbowl was until I googled it five seconds ago. And as I type this I feel like this same exact post happens every year where I tell you, “But I didn’t even know the Superbowl was coming up.” Annoying. Sorry, guys. We don’t change much. Except we do eat crab now as we shovel this dip into our mouths as often as possible. That’s a new thing. This dip was not meant to be skinny but it somehow ended up coming out at about 75 calories per serving, so CELEBRATE GOOD TIMES. This is skinny. It has lots of vegetables like artichokes, red peppers, and jalapeño peppers, so I guess it makes sense that it’s a little bit on the healthier side. Plus I swapped the heavy cream for 2% milk. And plus, I added extra cheese. So that… just… works. There’s a little bit of lemon juice, a creamy base made from scratch – no Velveeta sort of thing going on here, not that I wouldn’t love that in it’s own sort of way, but with crab? let’s move on. There’s a little bit of spice (J to the alapeño) and just the most luscious, silky texture. The thing about crab is it tastes less fishy and more delicately delicious, so you definitely do not need to be a seafood fanatic to dive your chip right into this little pool of yummy. Our new neighbors actually introduced us to this dip when they invited us over for a Welcome to the Neighborhood Party. Their hospitality was so unbelievably sweet. It just blows my mind that these people are all not just neighbors but truly friends, and that they live on this adorable block in the most charming houses, and they want to wine and dine with us: the scrappy new neighbors from the fixer-upper down the street. So I met my neighbors and ate my weight in Crab and Artichoke dip all in one night. If I can stop thinking about this dip in the next 48 hours it will be a miracle. Dorothy, look what you’ve started now. 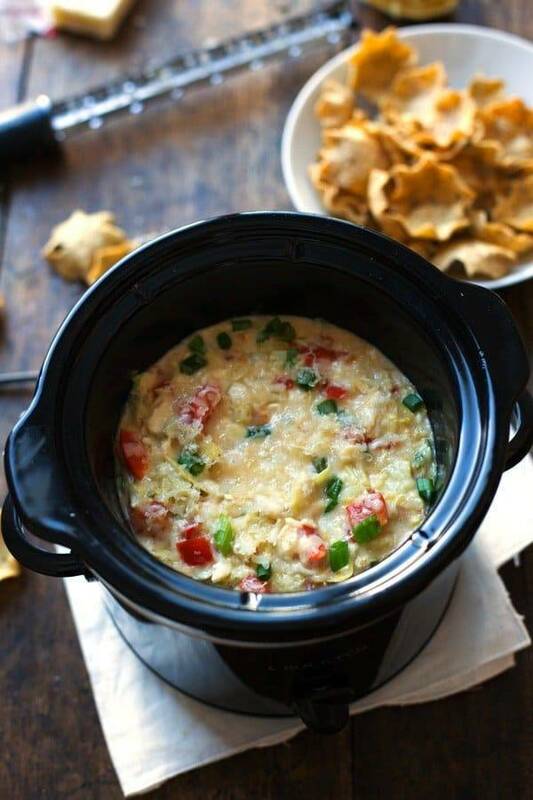 This Skinny Crab and Artichoke Dip has less than 100 calories per serving and is loaded with creamy, delicious flavor. Perfect appetizer! Remove the ribs and seeds from the jalapeno and the red bell pepper. In a large nonstick skillet over medium high heat, saute the peppers with a tiny bit of oil. You can also roast them without oil, stirring every few minutes to get a nicely browned exterior. When they are soft, set them aside. While the peppers are cooking, drain and chop the artichoke hearts. Drain the crab. Set aside. In the pan from step one, melt the butter. Add the flour and whisk until a thick paste forms. Let the mixture bubble for a minute or two. Slowly pour in the milk; whisk to incorporate. Keep the sauce over low heat – it should begin to thicken slightly. Add the salt, cheese, artichokes, crab, scallions, and lemon juice. Stir gently to combine. Add more liquid if needed. Transfer to a small crockpot or serving dish. Sprinkle with a little extra cheese and replace the crockpot cover so it melts just before party time (or broil if you’re using a regular serving dish). Serve on crackers or with dippin’ chips. Canned crab and artichokes work just fine for this recipe, but you don’t have to use canned if you have access to fresh. Lucky you! I definitely did not know when the Super Bowl was either. Literally thought it was in early January and kept wondering why people were still posting Game day food. Whoops! This is skinny?! For real! You are genius Lindsay, even if it was accidental! I am a total seafood fanatic, so I love that spin on the traditional spinach and artichoke dip goin’ on here! I need a mini crockpot in my life yesterday. I only knew about the super bowl when the news covered who got the prime time ads. I live in Australia , so only about two years ago did I know this was a super important event to Americans. Haha love when recipes are accidentally “skinny”. 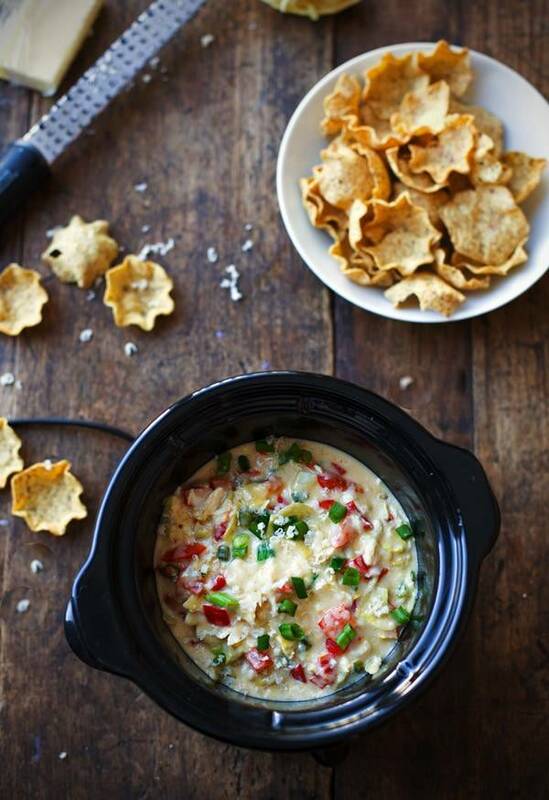 Crab dip is always a winner when you have guest about and OMG that crock pot is cute as! What brand is it? I thought the “big game” everyone was talking about was the olympics unti like 2 days ago. So… glad everyone is on top of this whole football thing. Can’t believe you don’t own a TV. Netflix = life. 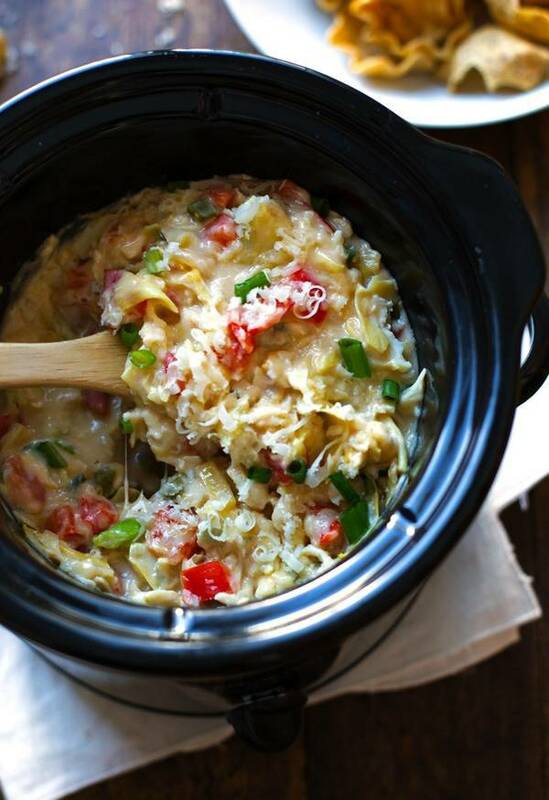 mini crockpot: favorite purchase of 2013….. Seriously! Ten bucks for party fun. Perfect for Super Bowl Sunday! A must make for sure. Thanks for sharing. My superbowl awareness has been heightened this year, living in the tri-state area (Connecticut) and being surrounded by constant hype, but I will still be spending 99% of our party eating, as opposed to watching the game! 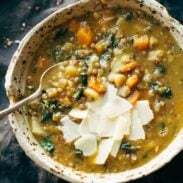 Thanks for another great use for the mini crock pot 🙂 Mine will be filled with bacon wrapped, manchego stuffed dates, but this recipe is going on the “to make” list. Can I ask why you don’t have a TV? We don’t either and it is such a rare thing to not own that I just had to ask. I love your blog. As a former twin city dweller I can relate to so much of what you write about (we’re some of your Eastern neighbors just across the border now). Thanks for your daily inspiration! Bjork actually grew up without a TV, and neither of us owned one when we got married, and from then on we just never bought one. At the time we had NO money for a TV, and now it’s kind of just become our thing. 🙂 We might get one eventually… it would be nice to have people over to watch live TV events. Thanks for the nice comment Mindy! Glad you’re settling in well in your neighbourhood! The dip looks amazing. Do you get everyone to eat it before it goes cold or is it OK luke warm/cold? I kept the mini crockpot on low for a few hours, but even on low it gets pretty warm, so after a while I just unplugged it and it stayed warm for easily another hour or two. I would definitely serve it warm, but it doesn’t need to be piping hot. It actually creamifies/thickens really nicely when it’s not so hot. Mmm this sounds AMAZING! I love crab and cheese, what a winning combination! I doubt we will watch the Superbowl either. I didn’t know when it was or who the teams were until yesterday 😉 Not my thing. I didn’t own a TV for 10 years and then I met my husband who thought that was weird. We watch a decent amount now, but I liked not having a TV it “forced” me to do creative things. The only thing I like about the Superbowl is the commercials. And the food. Good call. The original recipe from my neighbor/a magazine called for half and half, or heavy cream, I can’t remember. I think it was half and half. I did add a little bit to my leftovers just because… well, I love cream. 🙂 haha. But honestly, it still tasted extremely creamy and yum with just the milk! My husband and I got married Superbowl weekend and this is the only reason I know when it is. The dip sounds great! I need to throw a party now. We’ll have the game on the TV “just because”, but I think the thing we’re truly excited about is the food. My boyfriend is from Maryland, so any and all recipes that contain crab are a total MUST. The fact that this is skinny is blowing my mind! This looks amazing AND so much healthier than the dips with velveeta. That stuff scares me, the fact that it’s not refrigerated freaks me out haha! Enjoy your superbowl! On Superbowl Sunday I am all about the food and commercials…I could care less about the game. This dip, Lindsay. Holy yum. 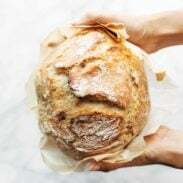 If I didn’t already have my groceries for what I am making on Sunday, this would be on my list! What a great dip, perfect for Super Bowl, and yes I watch for the commercials, most of the time they are the best. You cannot escape Super Bowl madness here in Denver! Go Broncos! It will be yet another day that I love this time zone (and yes, Peyton Manning and the team!) as we’ll watch the game at 4:30, be done by 7:30 or 8 and still get the kids in bed at an ok hour for a Sunday night. Pinning this crock pot recipe. Adriana @ Live. Laugh. Cook. Amazing! I just made crab & artichoke wontons for a Super Bowl snack appetizer post a couple of days ago. I used a crab & artichoke dip from Whole Foods — if only you had posted this a week sooner I would have made this and used this for the wonton filling! In any case, what a coincidence! Next time I made the wontons, or want to enjoy cheesy, crabby goodness, I’m going to use this recipe. Thanks! I love that you made this skinny! I have a wicked shellfish allergy and can never eat crab again, but what I wouldn’t give! pinned! Love a good crab and art dip. The kick of jalapeno makes me want to try this even more. I love crab dips and the fact that this is skinny makes even better. I never used to even watch the superbowl – it bored me to death. I grew up around it but never understood what the fuss was about. But my boyfriend and his family are crazy crazy fans. I’m expecting they’ll be getting me a jersey soon haah. We’re cooking up lots of delicious food on Sunday and I’m most excited for that and all the hilarious ads!